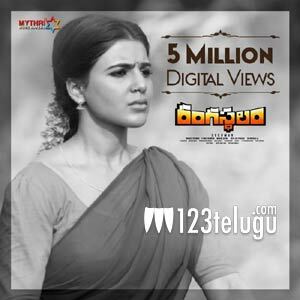 Released yesterday, the ‘Rama Lakshmi’ special teaser introducing Samantha’s character in the much-awaited period village drama, Rangasthalam, has taken social media by storm. The teaser stood at the 10th spot in the list of fastest Tollywood teasers to clock 1 million views on YouTube. Now, the Rama Lakshmi teaser has clocked over 5 million digital views in less than a day. This is undoubtedly a terrific feat for a female-oriented teaser. Samantha’s rustic village belle avatar has become a huge hit among her fans and they can’t wait to see her love story with Chitti Babu, played by Ram Charan. Sukumar has directed Rangasthalam, which has been produced under Mythri Movie Makers banner. DSP is the film’s music composer. Rangasthalam is slated to open in cinemas on March 30.